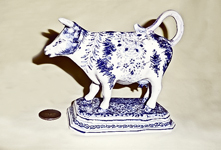 The Delft City website (www.delft.nl) features a number of factories that produce the famous pottery; for example the Royal Delft factory, Koninklijke Porceleyne Fles, dating from 1653, claims to be the only one that has remained operational in the city since the 17c. Their Royal Delft web site shows colorations that range from the traditional blue to polychrome, pinjacker (red, blue and gold decorations, based on Japanese Imari), and black. 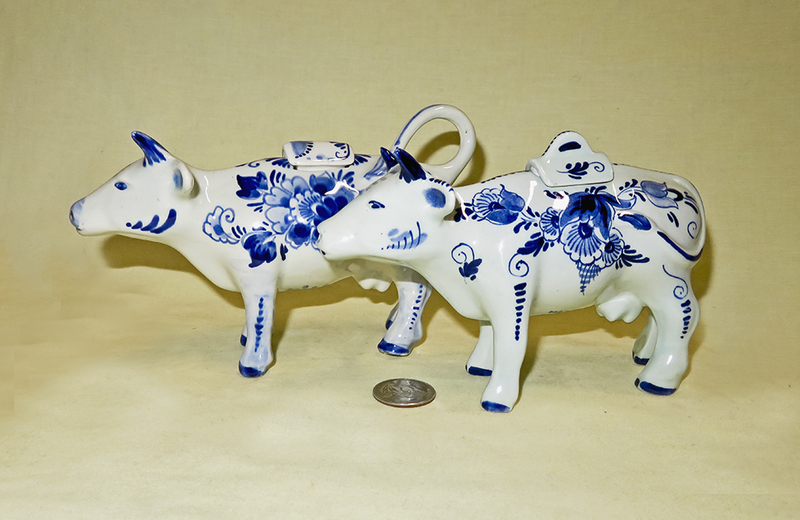 My collection has a few older or at least reproduction traditional Delft Blue cow creamers. 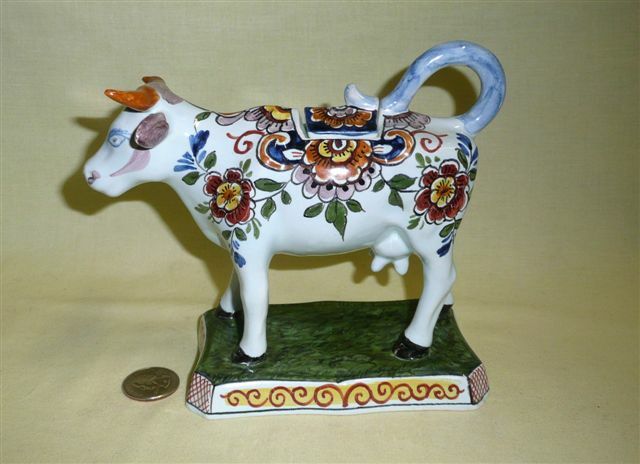 However most of the really great early Dutch pieces featuring cows are figurines not creamers, so as lovely as they are they haven’t made it to my collection. 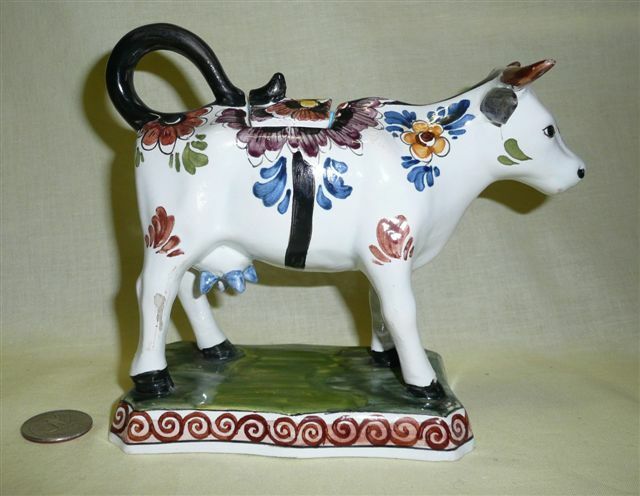 Although as noted on the ‘history’ page the Dutch were likely the first to fashion cow creamers, none that I am aware of were decorated in the ‘Delft’ style. On the other hand, that style or at least the coloration and decoration of Delft ware became so popular that it was widely adopted by potteries that were making cow creamers in the 19c and early 20c, so many of the fine pieces of what I am calling here ‘Delft’ were actually made in Germany or England. 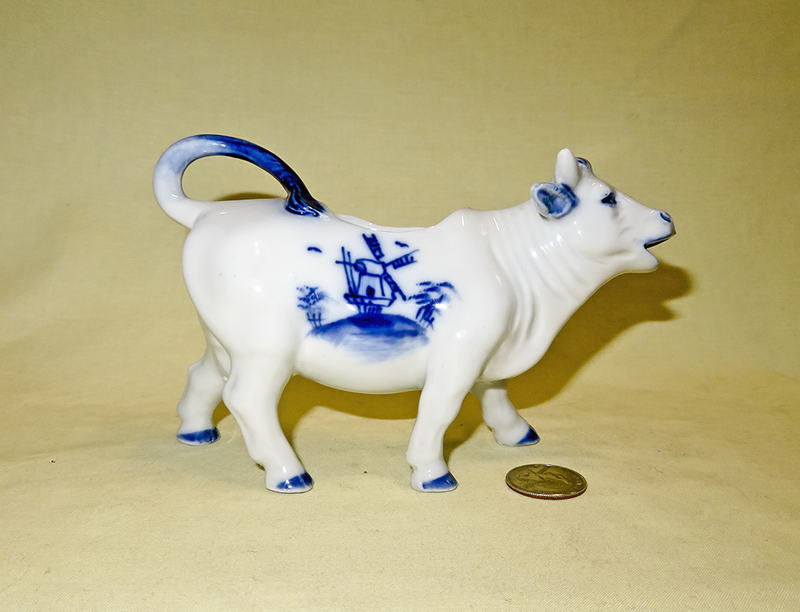 In addition, little cow creamers (as well as many other Delft pieces) make great souvenirs and tin-glazed earthenware is expensive so almost all of the ‘tourist type’ items, widely available in the city of Delft, are simply decorated in underglaze blue on a cheap white clay body. Even the term ‘Delft’ is no guarantee that a piece if from there, since the term isn’t copyrighted and as Wikipedia noted has come to mean the style more than the actual city. So in many cases despite the markings, the very recent ones come from Japan or China. Some with ’Delft’ like decorations and style are even souvenirs of other places – not least Holland, Michigan for example. As a reminder, click on any thumbnail to get a larger picture. My collection includes a few older ones and a small herd of the modern, mass-produced (if hand painted!) 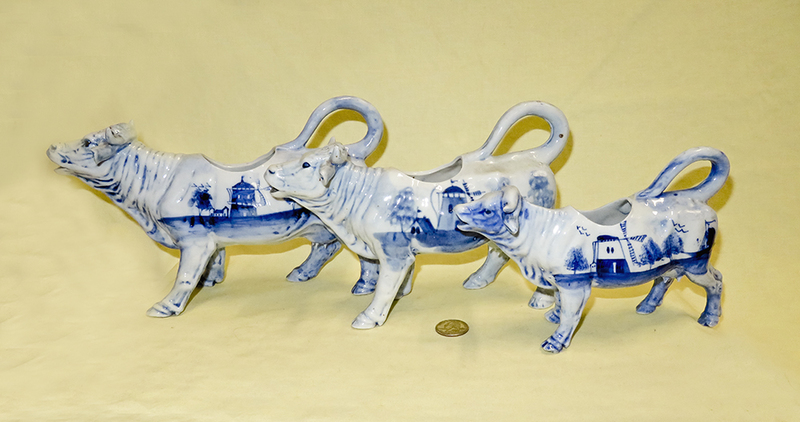 versions, many of which my wife and I bought in Delft when we visited there in the late ‘90s. This was another trip where we ended up having to buy an extra suitcase…Some of the range of variation is depicted here. 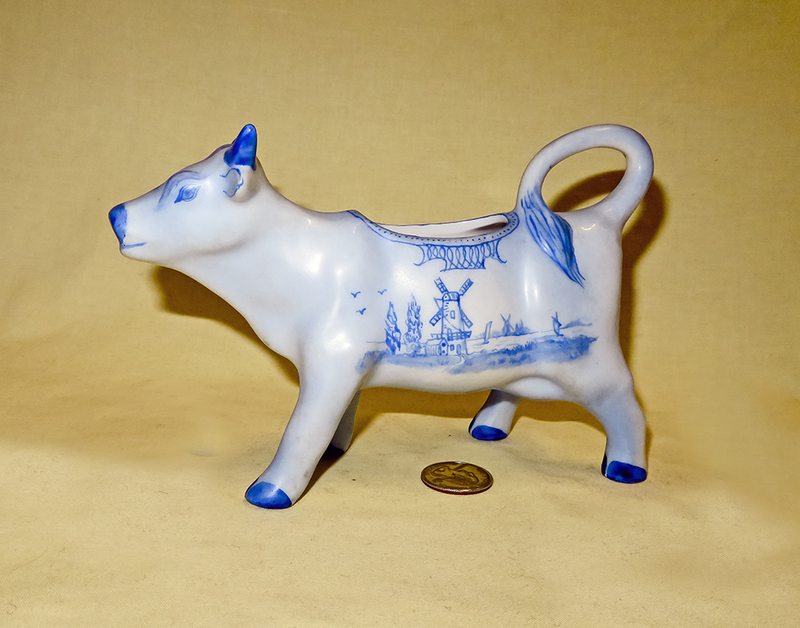 This is my one and only cow creamer that has, I believe, a legitimate claim to be early Delft Blauw - a lovely example from the late 19c. From what the seller said, the marks attribute this creamer to the Gebr. (brothers) Tichelaar factory, circa 1880-1895; currently named Tichelaars Koninklijke Makkumer Aardewerk-en Tegelfabriek (Royal Tichelaar Makkum). This supposedly was the first mark that they used. They have a neat website with an English version (start at http://www.tichelaar.nl/shop/ceramics.php) , from which I learned that “On a Spanish map from 1572, today’s location of Royal Tichelaar Makkum’s factory is already marked ‘bricaria’: a brickyard. It is the oldest proof of the company’s more than four centuries of uninterrupted ceramic history. By 1670, domestic pottery had replaced bricks as core business and from 1890 Royal Tichelaar Makkum concentrated on ornamental earthenware. The family company owes its continuity up to the present day to its appreciation of tradition, though with an eager eye for innovation.” They do have some cows on their web site shop, but none that are creamers…and given the current prices for the new ones, the amount I paid for this old beauty makes it a great bargain. 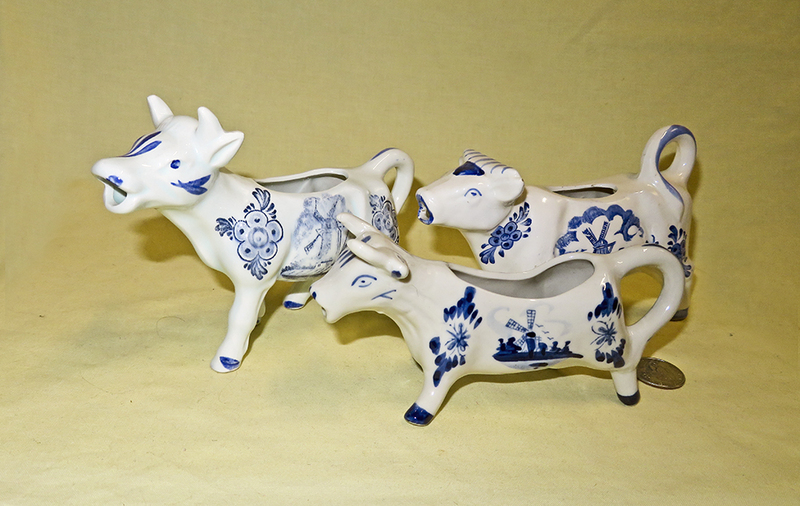 These two lovely Delft creamers, one blue and white and the other polychrome, are by different artists using Mold 795 of the Oud Delft Company, which - from www.sephari.com – we learn was founded by Roelof Elshout in 1920, as an offshoot of the Potterie Rembrandt in Nijmegen. The factory passed to his brother Hugo, then to Hugo’s daughter Cora in 1988. 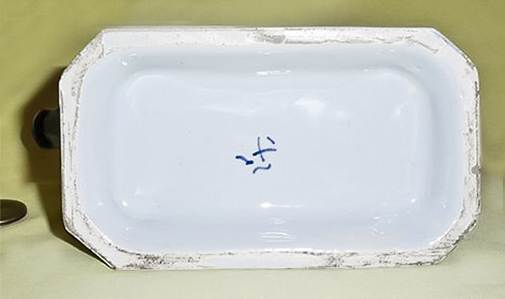 In 1996 the company was incorporated into Aardwerkfabirek’t Delftshce Huys B.V., and moved to Waddinxveen where it still manufactures earthenware products. I don’t know the age of these creamers, but they certainly date from before 1968 when the company switched from the hand-painted mark (a stylized potters wheel) to a printed version. 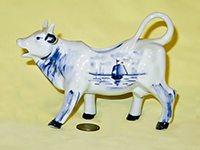 Oud Delft is noted for using an opaque white glaze with no tin or lead oxide, to mimic a tin-glazed look, over the white biscuit of modern Delftware. 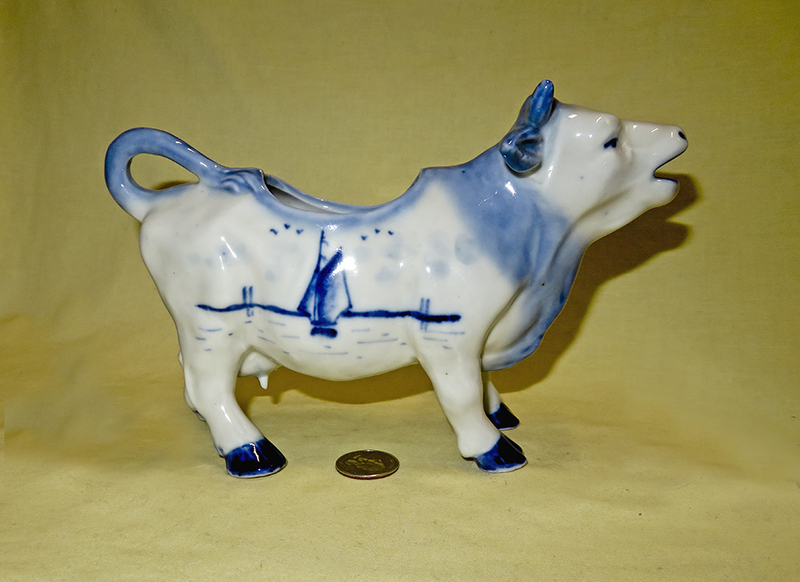 Here is another Oud Delft creamer from the same ‘795’ mold, this one clearly marked for manufacture in May 1963. I’d like to know if they have made cow creamers from different molds, but have been unable to locate contact information for the company or its successor. 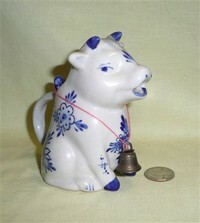 This creamer is quite similar to the two from Oud Delft. It is certainly from a very similar mold but has a different, duller glaze(probably tin), and a much rougher texture to the ceramic. The base bears the initials AL, but the maker’s mark is missing and appears from scratch marks to have been scraped or chipped off. Why someone would deliberately obliterate it I don’t know…perhaps it was considered a ‘second’ and the makers wanted to make sure it didn’t carry their mark? If so, it isn’t clear to me what the problem may have been. 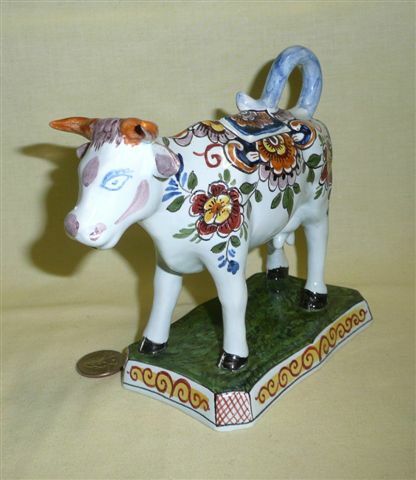 The seller, from the UK, marketed it as Faience, probably Angouleme, @19c; since she sells mostly Faience, and that term basically means tin-glazed earthenware, she could well be correct. I have included it here however because of its close resemblance to the two that are definitely Delft. Might it be that Oud, a fairly modern company, borrowed or copied an earlier mold? These modern well made creamers with lids are similar to each other but obviously from different molds at least for the tails. 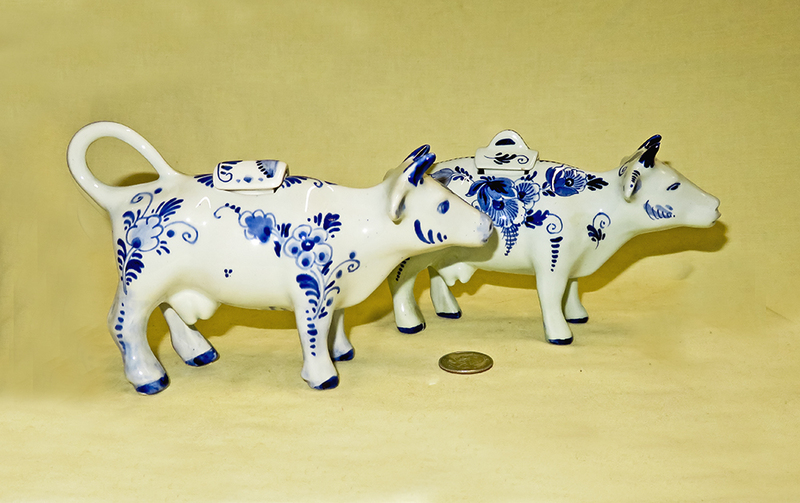 Based on the marking on their bellies they come from different potteries but both marked Delft and "Handpainted Holland". 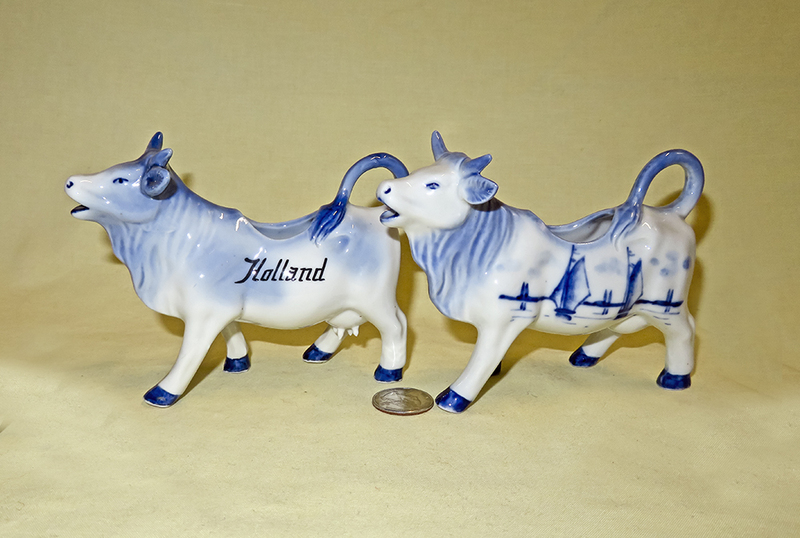 These two appear to be from quite similar molds, and at least one of them proudly proclaims itself to be from Holland, as well as having handpainted, Delft on the belly. Its neighbor lacks both marking and teats, so it could well be from somewhere else. 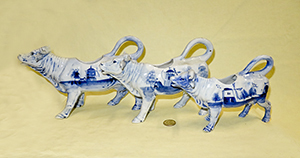 Here’s a nice and unusual rendition that I believe to be quite modern, and is at any rate different from many of my other Delft creamers – assuming, that is, that it really is Delft since many with that moniker refer more to the style of decoration than the locale of manufacture. 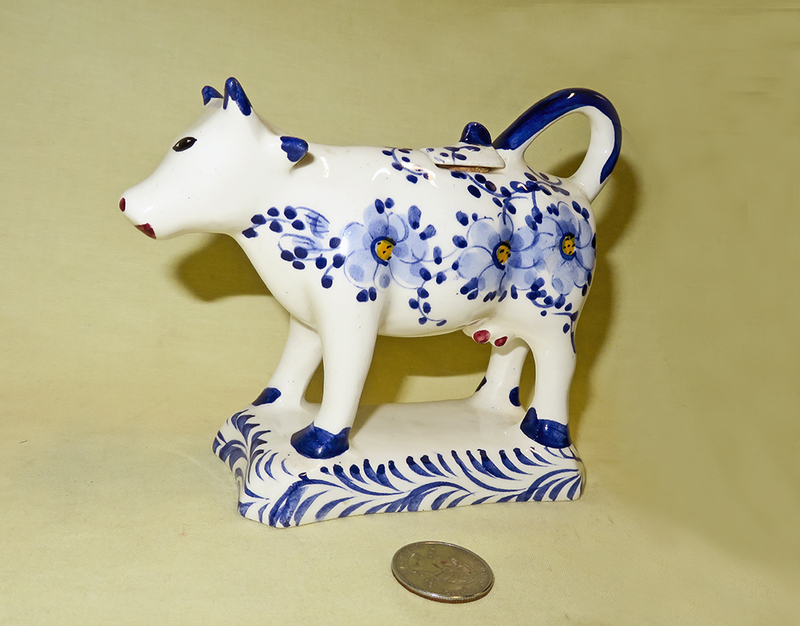 It’s hard to know for sure (although it was sold as vintage Delft), since its only markings are “15” and “F” written in blue, and it cane to me from exotic Arizona. The three flowers with yellow centers on each side are a nice touch, as are the bright red nostrils, small teats, and ‘lips’. Looks like it’s wearing lipstick. It is nicely made, with a small lid that bears the tip of the tail. These two hail from the Regina factory, their mold 1595. 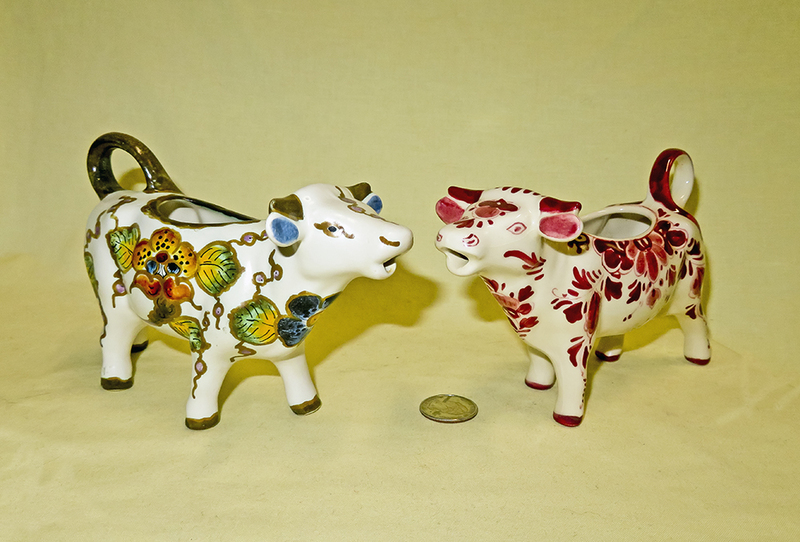 The one on the left is marked for Tiban-Gouda-Holland, and the red one just “Delft, handpainted, made in Holland”. Each is signed by the artist – and the chap who painted the one with the lovely flowers on the side had a bit of a sense of humor since he colored the inside of the ears blue. 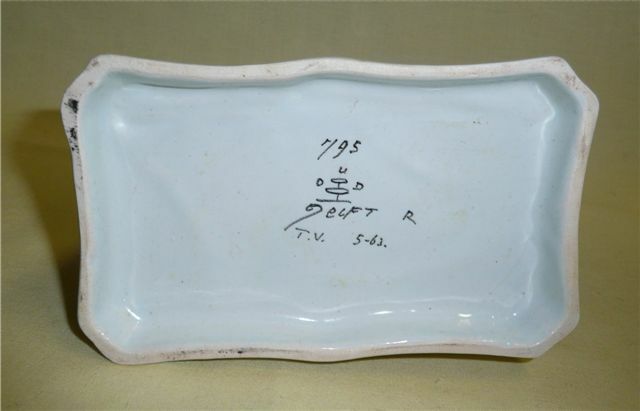 Wikipedia tells us that "The Regina pottery factory, Kunstaardewerkfabriek Regina, existed from 1898 to 1979. Located in Gouda, the factory was established in Queen Wilhelmina's coronation year 1898, hence the name Regina, Latin for "queen". 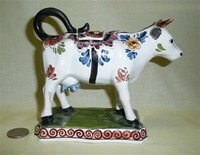 Initially, the company made earthenware tobacco pipes, like almost all Gouda pottery factories. The factory was founded by Gerrit Frederik van der Want, a descendant of the Gouda pottery family Van der Want, and Georges Antidth=oine Alexis Barras, a Belgian lender and art collector." 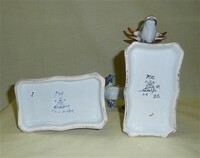 These two, like almost all Regina pottery pieces, bear the founder's initials, WB. 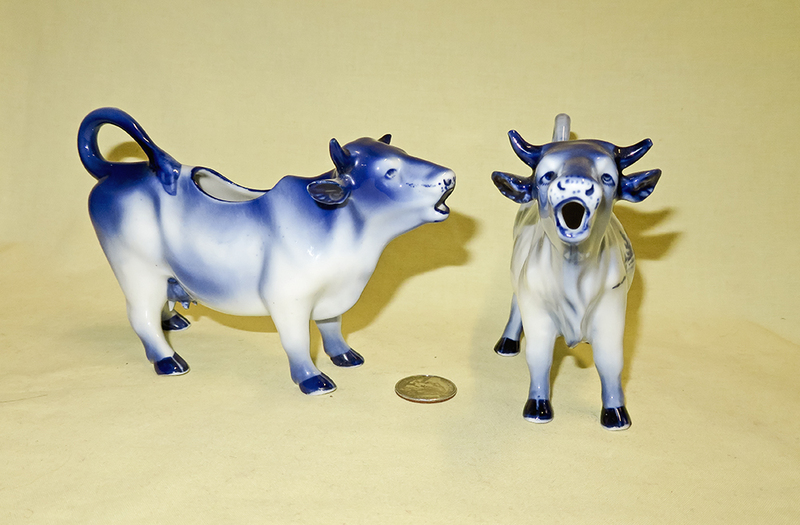 Regina apparently wasn't the only Dutch factory to make colorful versions of the popular Delft-ish cow creamer. All of these are clearly marked for a factory or artist, plus handpainted, Holland. The green one has a quite traditional flower on its right, but sports a somewnat fantastic bird on its left flank. Only one I've seen. Here are a whole bunch of modern ones, mass produced for the tourist trade; again, my wife and I got many of them actually in the city, both at the factories and at tourist shops downtown. They come in a wide variety of shapes. My wife and I acquired the very large (10” tall) pitcher shown in the left photo above when we visited Delft in 1997. Some 5 years later I got the larger of the two pitchers shown here, which is from the same mold but with different decoration, and marked for the “Biltmore Estate Collection, Genuine Delft”. George Vanderbilt, grandson of Cornelius, visited Ashville NC in 1888, found it ideal for his ‘country home’, and built the 250 room Biltmore House (‘French Renaissance Chateau’) there between 1889 and 1895. 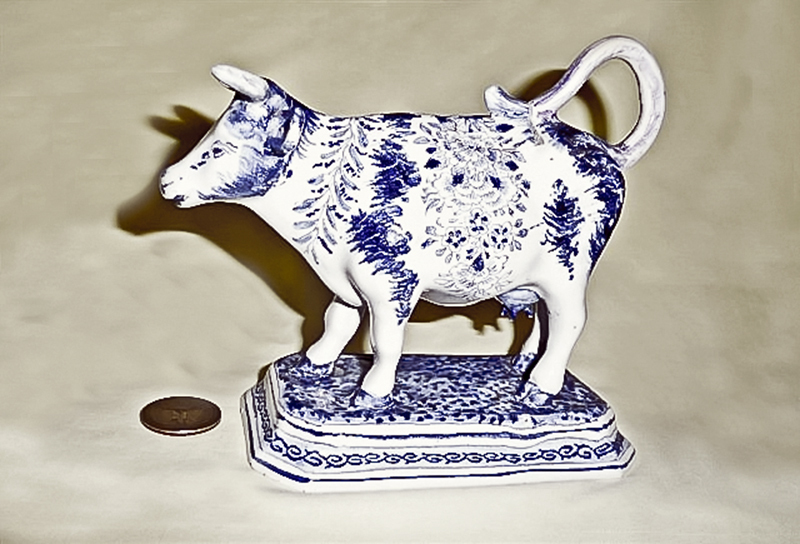 These days the house and huge estate are a major tourist destination that in addition to just letting folks gawk at the grounds and house has a luxury hotel, inn, and cottage, and peddles wine, ‘professional development’ and equestrian activity…in addition to geegaws like this Delft cow. 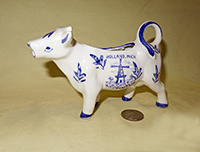 Its smaller neighbor (a mere 7 ½” tall) is a more recent acquisition, and is marked “Delft ©Deco, Handpainted Holland”, under a sketch of windmill, in an outline that looks to me sort of like a snowman. 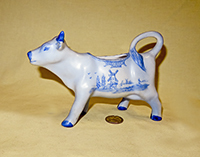 I do have another Delft-ish creamer similarly marked, so perhaps it really is from Holland. Here are several more examples of Delft cow creamers made for the tourist trade. 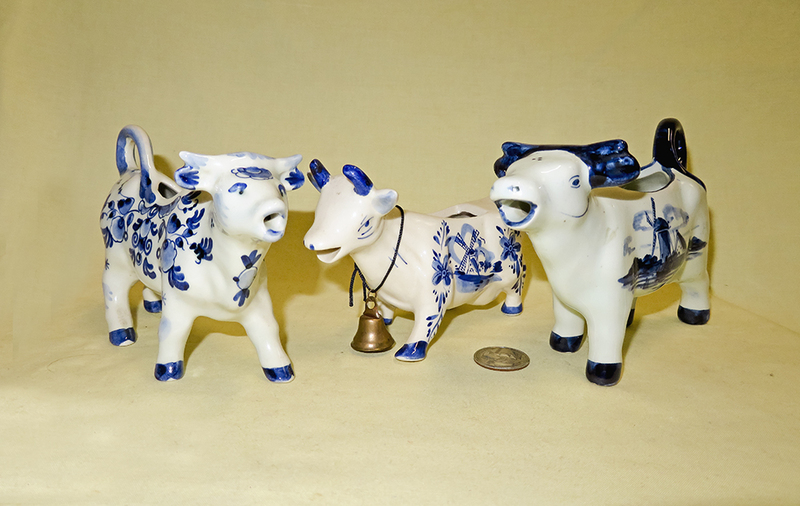 They are all marked for being Delft and handpainted in Holland. 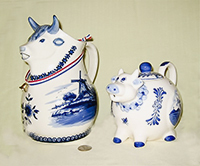 The little caricature on the right is for sure one only a tourist could love – it’s marked in blue with a crown over “Handpainted, Delftsblauw, 243” so presumably it like all the others here is indeed Delft. 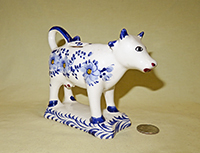 I quick search on ebay for 'delft cow' will turn up dozens like these in a wide variety of shapes and decorations, as well as many without Delft or Holland markings. Yet another two, both claiming to be hand painted and made in Holland. 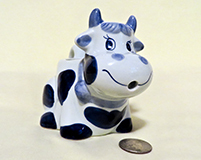 I guess I should be pleased that at least one European country still continues to produce cow creamers for touristic souvenirs. 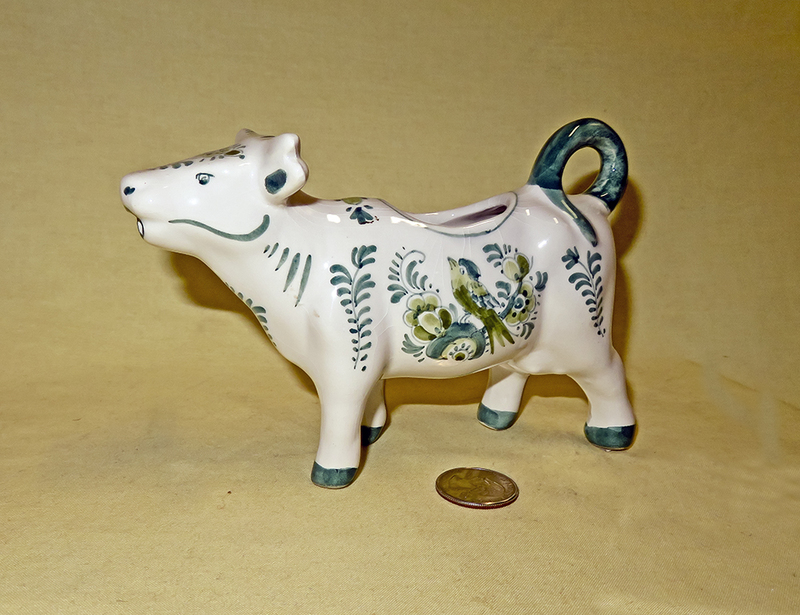 I do have a few Swiss ones, but almost all the other ‘new’ cow creamers seen to come from Asia these days. I’m not quite sure what to make of this little guy – rather crude heavy ceramic, with a belly-stamp and a silver sticker on the back of its head that reads Holland, hand painted, Delfts Blue, with a windmill in the background…and also on the sticker and a silver tag, “Origineel Bo-kado”. Can’t find them on the web…and since none of the terms are copyrighted, it might well be Chinese...but since its makers went to all the trouble of fashioning the fancy silver tag, I'll give them the advantage of the doubt and assume it's another Dutch Delft creamer made for the tourist trade..
As noted in the introduction, looking like a Delft-ware cow is no assurance that it is one. 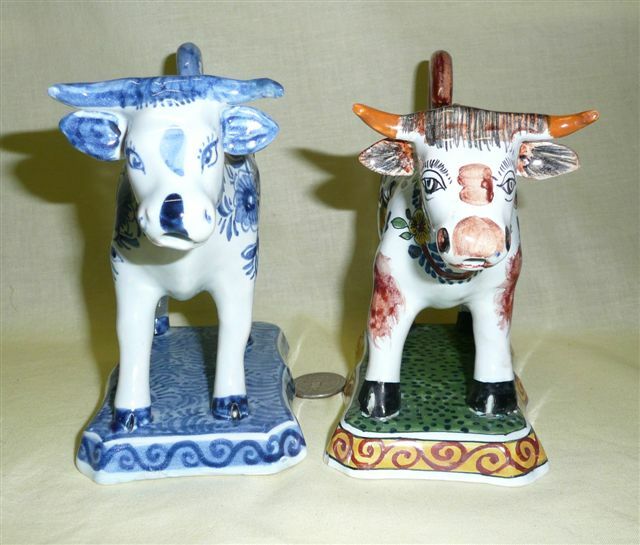 In the image on the left, the largest cow is marked for Japan and the others are unmarked but presumably from either there or China. The popular Delft blue coloring also seems to work for souvenirs of places that have no relationship whatsoever to Holland - here Paris with an Eifel tower, Hershey Park in Pennsylvania, and even Kentucky, sporting horses. At least these three have a modicum of Holland legitimacy - Holland, Michigan that is. The colorful ones are quite nicely done, but whether they were actually made there is somewhat open to debate. 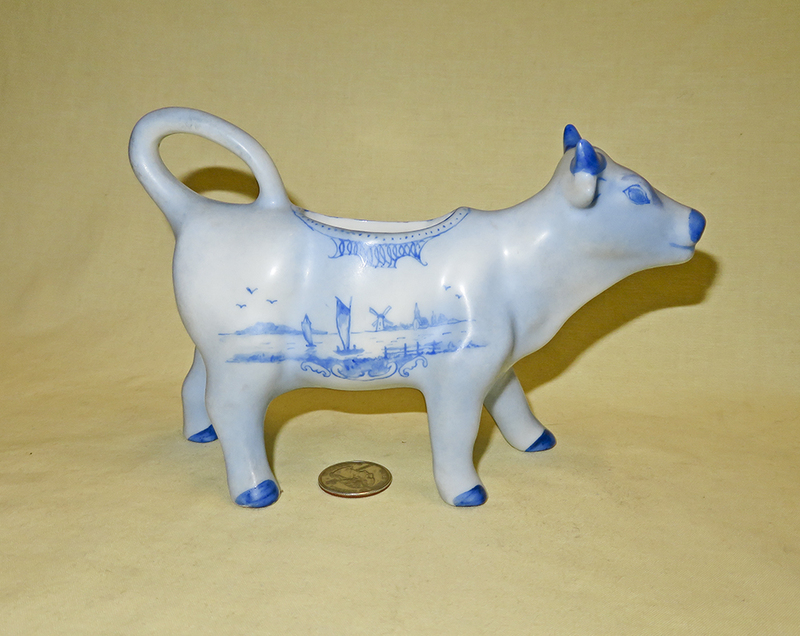 For the rest of this page, I will be featuring Delft ware cow creamers made elsewhere - most of them in Germany, and many of them from late 19c or early 20c. 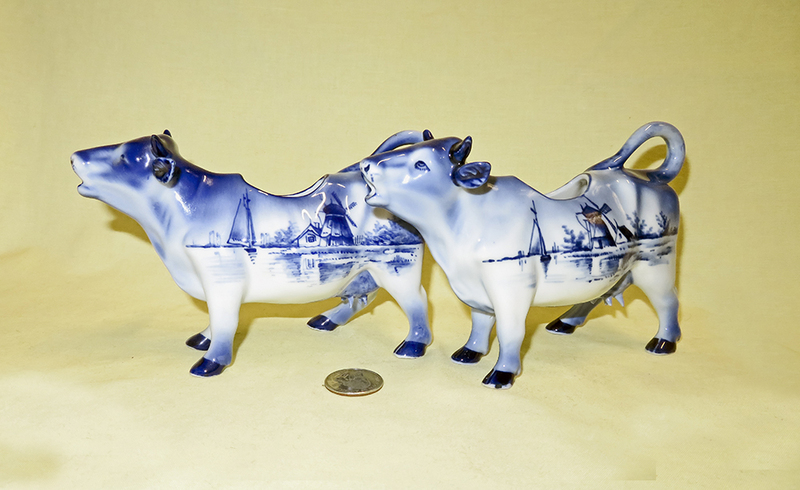 This lovely group of three large ones is a good place to start - they are porcelain, realistically molded, and adorned with pictures of an idyllic Dutch countryside - windmills, farm houses, birds and sailboats. They do not bear any maker's or national marks, but their style and quality imply that they came from one of the high end Gernman porcelain factories, when quality cow creamers were popular. From the frequency in which they appear on ebay this form seems to have been extremely well liked. 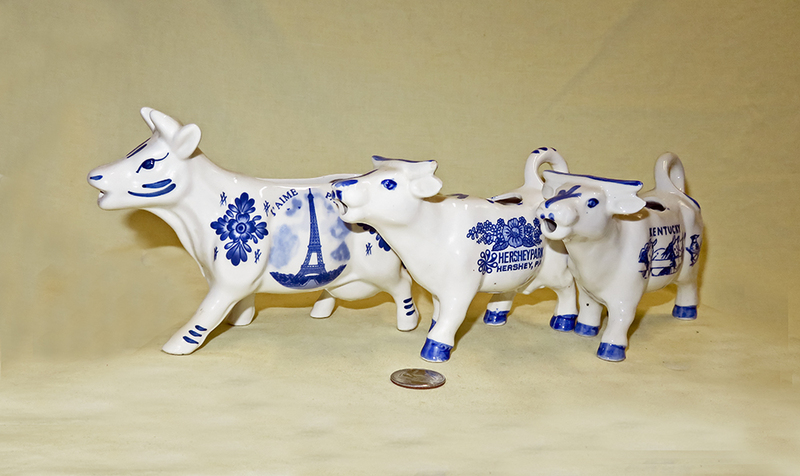 Here are three smaller German porcelain cow creamers, somewhat similar in style to the large ones above, with Delft coloration and decoration. In this case we know for sure they're from Germany because the bluish ones have it stamped on their belly, and the white one has it imprinted low on its left side. 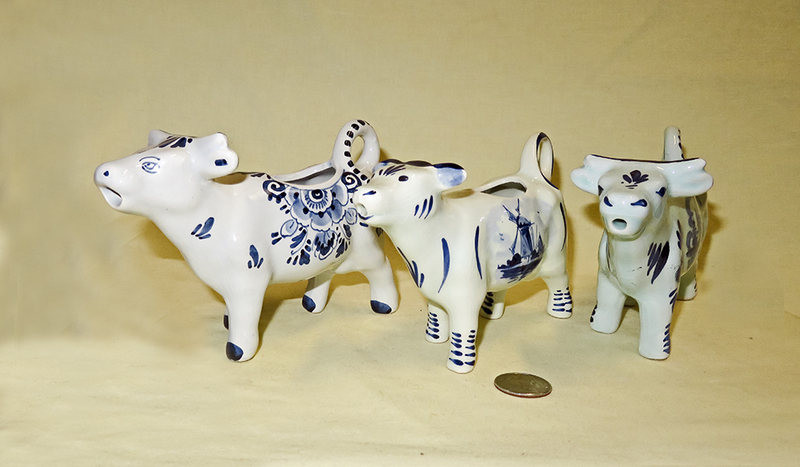 The one on the far left is a duplicarte of my father's cow creamer from when he was a child, and that dates it to early 20c. These two beauties are from one of my favorite molds. You will find lots like them in different sizes and colors, many with souvenir pictures, on other pages. These two are both marked for Genrany, and one has a maker's stamp that looks like it has two hockey sticks. 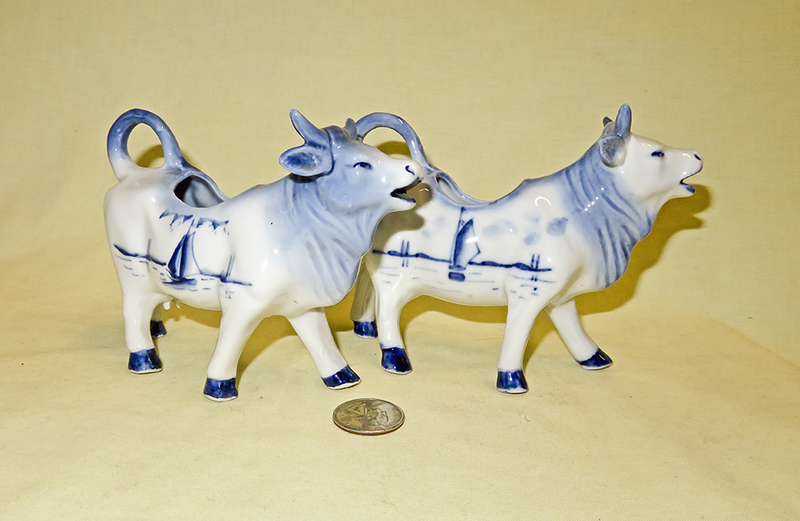 This is an interesting German pair – German for sure because it’s incised on the right flank of the larger one, along with a mold mark; the smaller has just a mold mark. These have the decoration on only one side, but feature ‘birds’ like some of the others fancy ones. 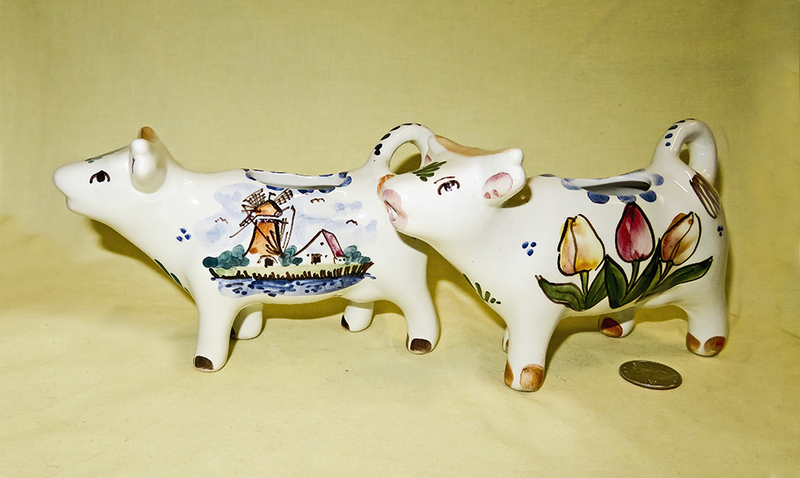 Here are yet more fairly modern creamers with dutch scenery designs...windmills and farm houses. These are porcelain and most of them are marked for Germany. The one in the right rear in the left image seems to have a decal rather than a hand painted scene on its left flank. The ones lying down in the right hand image appear from ebay sales to be the most popular of this lot. 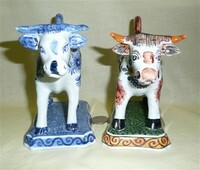 The cow on the left is painted in the traditional Delft fashion, but is from a mold that I hadn’t seen before. 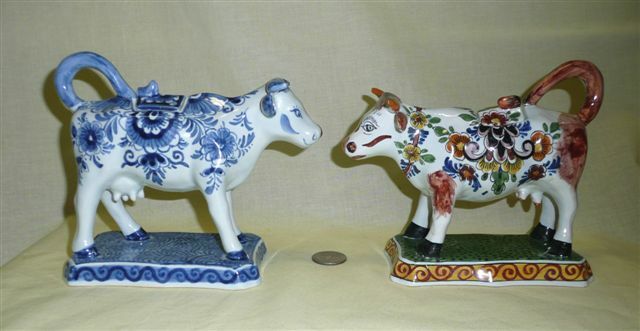 The one on the right is whiter than most that have Delft blue decorations. Neither are marked, thus very likely not from Holland. 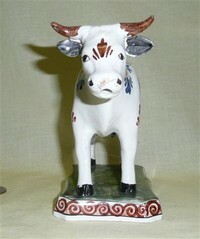 This fairly large and stout cow is marked “Delf” in script on its belly. It’s well molded porcelain, almost certainly of German origin and early 20c. 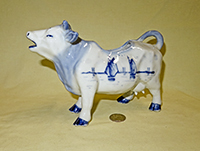 Here’s another lovely, realistic porcelain creamer in Delft style with a faint script ‘Delft’ on the belly. Again, I assume German-made. 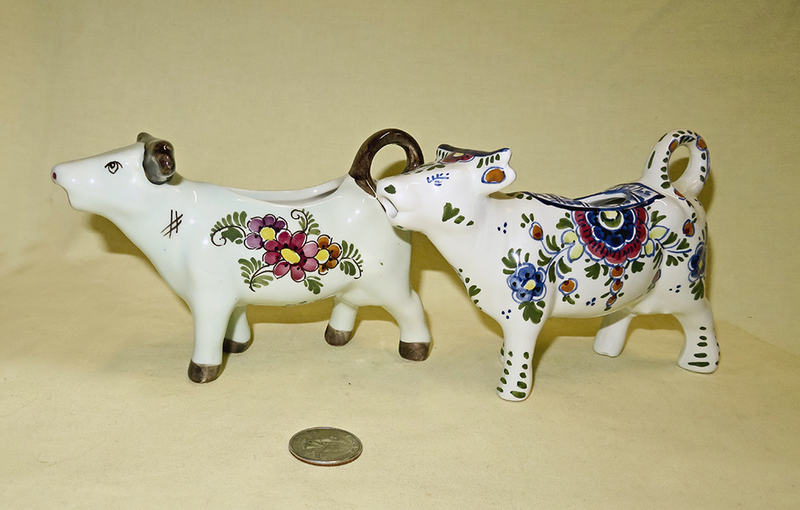 This pair appears to be from the same mold although the coloration, decorations and teats are quite different. 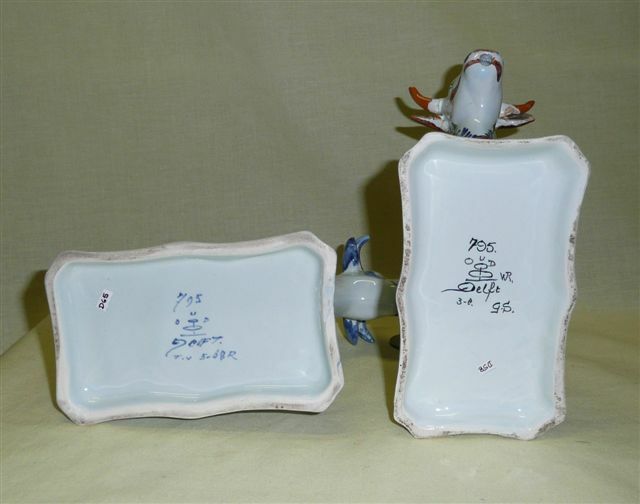 Neither are marked, but both are likely from Germany..
To finish off this page, here is a very unusual one, a lovely light blue with no heavy glaze. It might not even belong in this category except for its decorations. It is marked in script for W.H.Sechler. I have searched for information about him or her, to no avail.